The bicycle has been a democratic instrument since the day it was invented. 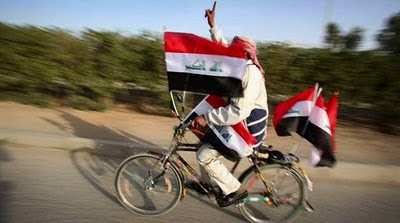 Here's an Iraqi man - a Citizen Cyclist - in Najaf on his bicycle, raising his inky blue finger proudly and defiantly in the air as he heads away from the polling station in the recent elections. As seen on Politiken's website. Thanks to Jacob for the link.